Sales professionals are often compared with professional athletes. * steady dose of motivation. To think that anyone or anything can provide lasting motivation for you is erroneous. Only you can motivate yourself, with your positive habit and positive attitude and this type of habit is created from your small -small habit in your daily life in your whole day routine, and you do this by constantly expecting more from yourself and then realizing the rewards of your commitment. 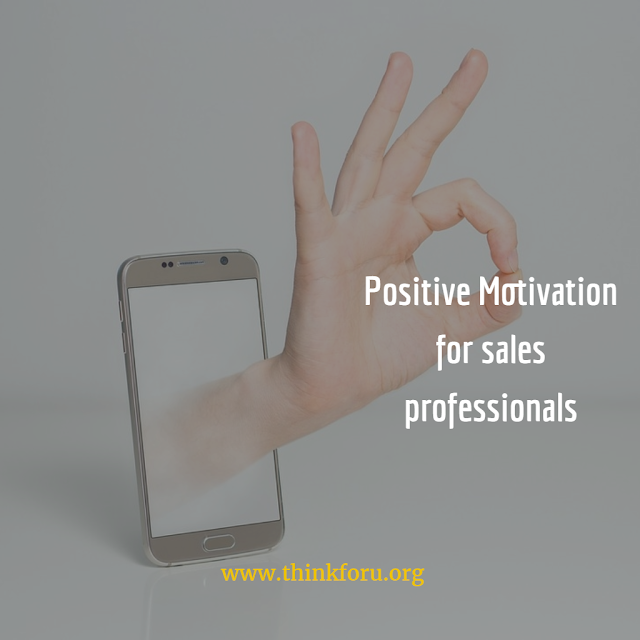 Finding sources of motivation, positive thinking, positive attitude, positive status, positive energy., that help you maintain your level of commitment is critical to your long-term success in sales. IF You are a busy professional. if left unattended would begin to affect your life negatively. Singer/Songwriter Harry Chapin once said that "good tired" comes at the end of a day that you may have lost most of the battles you fought. But, you lost fighting your battles, chasing your dreams and living your life. In a world in which sales professionals are expected to be so many things to so many people, it's easy to lose track of getting the things done that mean the most to you. Positive people enjoy their lives more than do negative people. Many people firmly believe that through positive thinking, they are not only more open to opportunities but that more opportunities are open to them. But the challenge is "how" to think more positively in spite of the constant stream of bad news that invade most of our waking moments? read the paper or have a conversation with a co-worker who is less than optimistic about work. लेकिन बुरी खबरों के निरंतर प्रवाह के बावजूद चुनौती "कैसे" अधिक सकारात्मक सोचने के लिए है जो हमारे जागने वाले क्षणों पर आक्रमण करते हैं?